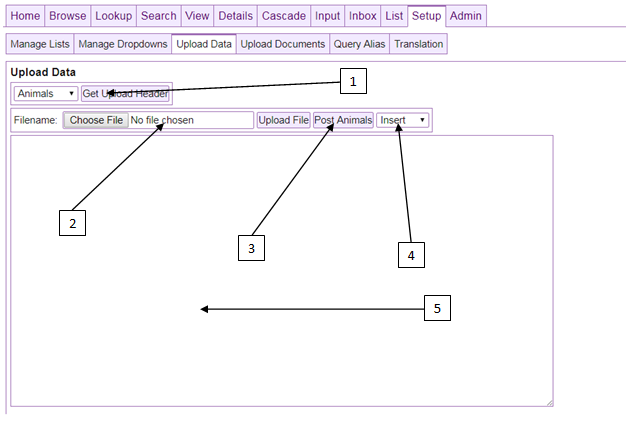 The Upload Data module is for uploading data in bulk form. If child records are being uploaded it will be necessary to have the Record ID (not including the letter layout id prefix) of the parent so that the child record can be attached to its parent. This module is accessible through the Upload Data button on the left of the Setup tab and is only available to users with Superuser or Admin permission. Data uploaded through this module is validated including testing of field values against dropdown lists. This button is for getting a header row for the bulk upload. The data file to be uploaded needs a header row with all of the proper fields, this will get the headers from the database and output them to the textarea below based on the layout type and the upload type, either Edit or Insert (See 5). This is the file input for uploading the data to be bulk loaded to the database. Data must be first uploaded to the textarea, then posted into the database. This is the button for posting to the database. This will submit the rows to the database returning rows that do not validate. This is the dropdown for choosing the upload type, either Insert or Edit. When inserting standalone or parent records, the link value corresponding to the data_table id need not be be specified. When editing records or inserting child records the id of either the record be edited or the parent record must be specified, respectively. The textarea is the workspace for this module. It can contain the header requested, the data to be uploaded, and the specific data rows rejected by the module after posting because of validation issues.